Like to run an Irish Castle for a Day? 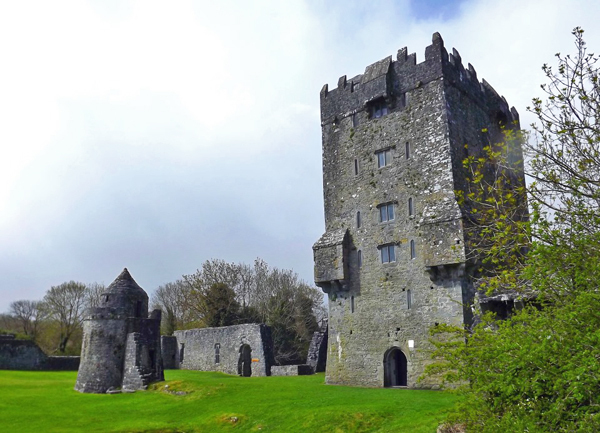 Would you like to run an Irish Castle for a day? Sound exciting? But we’re not just talking about a castle – also the large family estate of lands that surround it. 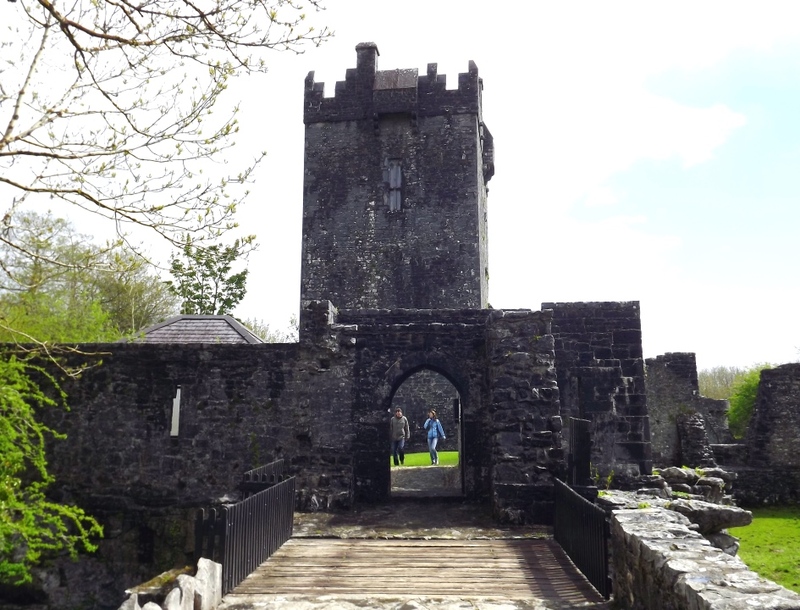 You see, a few weeks back, Carina and myself went to County Galway and visited Aughnanure castle in Oughterard. Ever been there? Aughnanure was the main castle of the O’Flaherty Clan – the kings and lords of West Connaught – and was one of five castles they kept in the area. The O’Flahertys were lords of the Ui Bruin Seala sept originally from around present day Galway city, but were driven west in the 1200s where they held sway for over 400 years. But – that’s not what we want to talk about today. Back to household management. What caught our eye in this Irish castle was a great illustration of the people it took to support a Gaelic royal household at the time. It gave us an insight into Gaelic society of mediaeval times and when we dug a little deeper, many of the roles were held by particular families – maybe you’ll see you own surname? But there was very little information – so we decided to dig a little deeper and here’s what we came up with. The word Ollamh is used today to mean “professor” but in medieval times it meant scholar or master – often the master of a particular discipline. When the word “Ollamh” was used by itself, it typically meant a scholar historian/poet/genealogist. The Ollamh for history and poetry for the O’Flahertys (recording of genealogies, writing up of events, writing of poems) fell to the Killkelly family. While every chief had its own ollamh, the head ollamh of a province such as Connaught would have been the head of all the ollamhs in that province, and would have been a social equal of the provincial king. Other typical family names for the Ollamhs were O’Dalaigh (Daly), Cassidy, Ward, Forbes, Higgins, Keenan, Mulconroy and Cleary. The practice of medicine was reserved for a select number of families. Father typically passed his medical knowledge to son and sometimes to daughter or kinsman – ensuring that specific family groups retained the knowledge as hereditary physicians. The Physician family to the O’Flahertys were the Canavans. Other physician families included Cassidy, Shields, Callinan, Beglin, Hickey and Lee. Early Irish law was known as Brehon law. It was a complex system of law that delivered judgements based on the strict hierarchy that existed in Gaelic society. Each Gaelic chieftain had their own judge (Brehon) to interpret the laws against individual local cases. The O’Mullawill family (also known as Lavelle) is the Brehon (judge) of O’Flaherty. There were many Brehon families in Ireland who ran the law schools and maintained an expertise within their own family – names such as Breslin, Davoren, Donnellan, Coffey, Keenan and Egan. The steward was responsible for the day to day running of the castle – preparing of banquets, sourcing provisions, directing the servants. The Morrolly family provided the head stewards for the O’Flahertys. A Gaelic Chieftain typically had to maintain a standing army, however small, of a number of horsemen and soldiers. He often brought in Gallowglass (mercenaries) for particular battles. I’m not sure who the marshalls and commanders of the horse were for the O’Flahertys – but my own mother’s family – the Mannions – were responsible for marshalling the forces (and leading into battle) of the O’Kellys in nearby east Galway. That explains why you always did what you were told in our house! The Erenagh was effectively the rent and tithe collector (close to a modern accountant) for church and parish lands. The Erenagh family within one of the O’Flahertys territories were the O’Leathcargais. Other Erenagh families from around the country were the Cronins for the McCarthys, the MacInerneys for the MacNamaras (in fact, MacInerney literally means “son of the Eranagh”), Lennon, Farrelly, O’Herlihy, Connole, O’Doorty, Sheridan, Hourihan and Scullin. Remember that honey provided the only source of sweetness in the Irish diet – something to be nurtured, cherished and guarded. The O’Conlachtna were the keepers of the Bees for the O’Flahertys. And that’s only touching the surface of the roles and tasks that it took to run a Gaelic Chieftains affairs. In future newsletters, we’ll come back to this and include some of your own stories and family surnames. The most interesting thing for me is to realise that Irish families often had certain traditional work running through the generations (my own family of Collins’ were boatbuilders and carpenters for generations) as well as being anchored in particular locations. How about you? DO certain professions and roles run in your own family? Maybe you see one of your family surnames above? If you’d like to tell a story or ask a question – just comment below – we’d love to hear from you. My maiden name is Hamill. Dad’s father was from Western Ireland. He and my Grand mother, from Germany, lived in Ireland. Mom’s parents were both from Poland. I have no idea of my past. My Grand Parents lived in Waterfood and at that time were like the only Catholic’s. Kathy, Hamill is from the Irish Ó hÁdhmaill – and is mostly found around counties Tyrone and Armagh – not so much in the west of Ireland. Mike. Hi Rebecca – thanks for the lovely note! http://www.irishorigenes.com/clans-castles-database gives a great listing of which castle belonged to whom. Mike. All my family seem to have been farmers. Armstrong, Beatty, Layng, Young, Graham and St Lawrence. Mainly seem to be Sligo and Dublin. Many went to USA, Australia and New Zealand in the 1870’s. Still trying to sort them all out. I love this history on this article Mike! I just can’t seem to get enough history of Ireland. I had to cut some things off my itinerary for April 2014 but maybe I will be able to come home again another time and see all I wish to see. Thank you and God bless you! You’re welcome Mary Beth – Need to plan a longer trip the next time 🙂 Mike. Susan – I have put more info on the McCorry surname here: http://www.youririshheritage.com/the-surname-maccorry/ – Mike. My 3x great grandfather was John Morley (aka Morilly, Morrilly, Morrolly) from Bekan, County Mayo. His daughter Mary Ann and her husband James Patrick Holmes from Galway, settled with their daughters in Waltham, MA and thence Pawtucket, RI where I was born. I’ve been trying to find out what the family might have done in the distant past. Thanks for letting me know that they might have been stewards to the O’Flahertys. Hi Elizabeth – you’re welcome. Its always nice to get a different angle on your family name. Mike.